A Birmingham City fan has become England's first Chant Laureate. Jonny Hurst, from Wanstead, north London, will be paid £10,000-a-year to tour Premiership stadiums and compose chants for the 2004-5 football season. Mr Hurst won the Barclaycard-run contest, which attracted about 1,500 entries, with a chant for his own club's arch-rivals, Aston Villa. Poet Laureate Andrew Motion chaired the panel of judges that unanimously selected Mr Hurst, 37, for the job. Mr Motion told BBC Radio 4's Today programme: "What we were looking for was wit, humour, energy, inventiveness, and the ability to be taken up by the people on the terraces. "Jonny is absolutely wonderful at it. He stood out head and shoulders above the others." Mr Hurst, a self-employed solicitor, will as Chant Laureate earn twice the amount paid to the Poet Laureate. "It is just a dream job," he said. "It combines my love of music, sport and comedy. It's a dream package." His winning chant, to the tune of Barry Manilow's Copacabana, was written about Aston Villa's Juan Pablo Angel. Mr Hurst said he had written chants about every Premiership club and submitted the one he felt was the best. He admitted that if he did not produce one as good for Birmingham City next season, "my days are numbered". Entries to the competition ranged from the poetic to the obscene and included 415 applications from Liverpool fans alone. Manchester United supporters sent 122 and Arsenal fans 121. "What we felt we were tapping into was a huge reservoir of folk poetry," Mr Motion said. "Poetry belongs in the world and to hear it out there in the world is marvellous." Does football need a Chant Laureate? What do you think of Mr Hurst's winning entry? Do you think you can do better? If so, send us your chants using the form below. I think it is a complete waste of money - admittedly this guy may have a talent for football chants, but the best chants are made by the teams fans themselves. As an Arsenal fan I wouldn't want to join in a chant made up by a Spurs fan - so why would Villa want one by a Birmingham fan? Each set of fans have their own style - Arsenal's Freddie Ljungberg chant set to an Andy Williams song came from the Gooners and that's where they should stay! No football doesn't need a Chant Laureate....fans don't need a 'self employed lawyer' to create chants. Fans make their own chants have as part of the fantastic football culture that has existed here for 100 years or so....a culture that is in severe danger of dying out due to this sort of thing. We don't need the clubs, the FA and the money men telling us what we should sing about. They are our folk songs that mirror or desires, our dreams and in some cases our hates. Chant laureate ? Imitation Blues fans singing crap Villa songs Do me a favour. 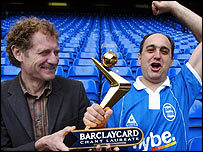 This is nothing new - Brighton and Hove Albion have had a "Poet in Residence" since 2000 - none other than punk performance poet (not to mention electric mandolin player) Attila the Stockbroker. What a complete load of rubbish, who ever heard of a "true" fan making up songs for rival clubs? Most chants arise during games in response to events, and are as such created within the grounds themselves. What is this guy planning to do, go around handing out song sheets? The chant that won this competition shows how worthless it is. It's too long, and no one remembers the tune much anyway. Its just another case of people cashing in off the back of football. Football doesn't need a chant laureate, especially if the chant that won was a dire as that, it makes me wonder how bad the losing entries were. Chants should be simple and to the point, not some long winded rubbish about a rubbish Midlands club and what sort of city fan would compose a song about his arch rivals which wasn't insulting?! Ridiculous, beyond belief. Pay someone to come up with chants? I cannot believe the amount of money that is wasted on things like this these days? This guy talented I think not. What next? Paying someone to go round working men's clubs creating crude limericks? Spend the money on something useful, like cleaning up the rubbish after football matches or crowd control for the hooligans that love these chants to provoke each other. What a pathetic load of garbage. If the premiership wasn't so commercial and soulless, fans would sing there own songs as they have done for many, many years. Football is no longer the working class man's love affair, it dying fast and ideas and people like this are simply hammering in the final few nails. This bloke's come up with a pretty good effort but I don't think he's going to be very welcome at the Blues next year. What possessed him to write about the one team his club hates above all others? It makes me think he's not as big a football fan as he might appear. "Chanting has secured its place as a modern art form"